Been a while since I did any Powered Up conversions! Lol. Not as long as my last lull, but still. What are we looking at? Well, this is another piece in my line of art in the style of Capcom's "MegaMan Powered Up". I am more fond of that game than I think anyone knows. Lol. Anyway - this Powered Up is not of an existing Robot Master. This is actually a NetNavi-to-RobotMaster conversion like SharkMan Powered Up. And like SharkMan Powered Up, I took quite a few liberties with this design. 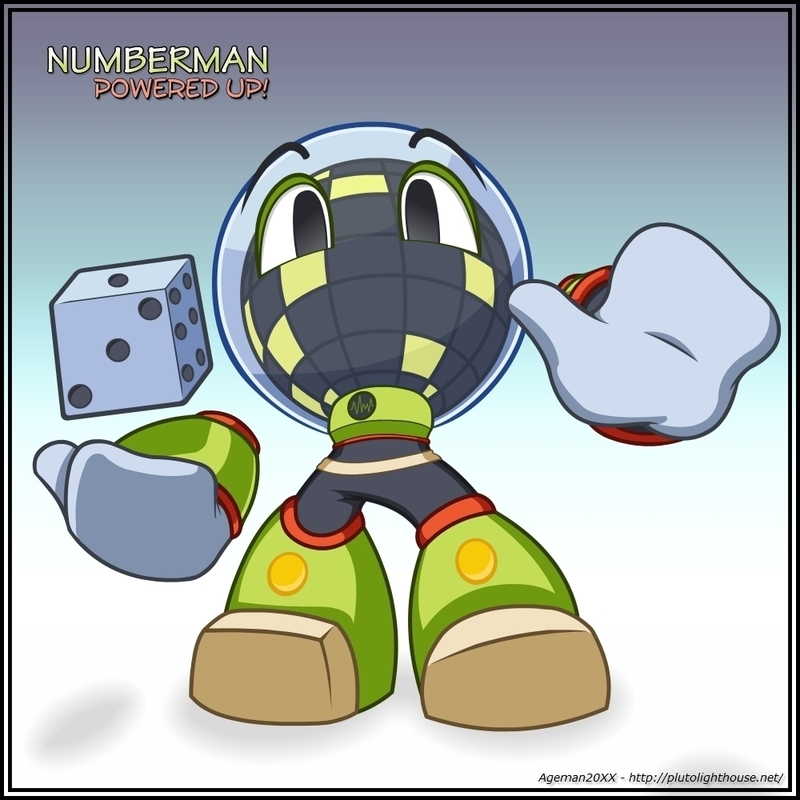 Only keeping the colour-scheme and dice from the original (whereas CosmoMan Powered Up was pretty much a direct copy of his Navi form...just chibi). Why NumberMan? I think he is one of the coolest original Navis in the EXE/Battle Network series. I even kinda liked him in the anime...don't know why though. Haha. But yeah, he was pretty cool so I decided to use him as a base. Obviously his hands-as-mits might look a bit lazy, it probably was at the time, actually. I actually drew this a while ago...maybe 1 or 2 years ago? I just didn't colour it until now, and even though I didn't change the mits, I did change a lot of other things from the original pencil. If I did him again I'd give him classic NumberMan.exe hands, but for now the mits'll do. As far as everything else goes, I actually think this one turned out well. I tried something new with the linework and hopefully it comes across as well as I hoped it would. Let me know what you think so I can adjust for future efforts.